Those who have read Christopher de Hamel’s 2001 The Book. A History of the Bible or his 2011 Bibles – An Illustrated History from Papyrus to Print (or any of his other books about medieval manuscripts) may have wished that they could have lingered longer over a select few of the hundreds of manuscripts that are mentioned therein. Such readers get their wish in De Hamel’s latest work, Meetings With Remarkable Manuscripts. Twelve medieval manuscripts – of which a few are Biblical texts – are closely examined and their history is explored. Following a brief preface in which Dr. de Hamel explains how to collate a manuscript (he is describing a general collation – counting pages and quires – not the sort of meticulous textual comparisons done for New Testament manuscripts), he devotes a chapter to each of the following manuscripts: the Gospels of Saint Augustine, Codex Amiatinus , the Book of Kells, the Leiden Arata, the Morgan Beatus, Jerome’s Commentary on Isaiah (Bodley 717), the Copenhagen Psalter, the Carmina Burana, the Book of Hours of Jeanne de Navarre, the Hengwrt Chaucer, the Visconti Semideus, and the Spinola Book of Hours. All of these manuscripts can be viewed via these embedded links. Each one has a claim to fame of some sort. In the chapter about the Book of Hours of Jeanne de Navarre, not only do we see some excellent illustrations, framed within barbed quatrefoils, but we also learn about this book’s relatively recent history; it was thought to have been lost or destroyed in World War II after being looted by the Nazis and seized by Hermann Göring, but it survived, and was placed in the National Library of France in 1973. ● The text in the Gospels of Saint Augustine not only echoes a very early Vulgate text but occasionally contains Old Latin readings shared in the homilies of Gregory the Great. This manuscript has a page of illustrations somewhat like comic-book panels depicting events in the life of Christ (125r). Constantine Tischendorf inspected the manuscript and signed his name on a flyleaf in the back in 1865. De Hamel shares an anecdote about the time when he, as the curator of the Parker Library, was entrusted with the care of the Saint Augustine’s Gospels when the manuscript was used in 2003 at the enthronement-ceremony of Rowan Williams as Archbishop of Canterbury. As he was carrying the manuscript in a formal procession, and the congregation sang the hymn, “Immortal, Invisible, God Only Wise,” its thin parchment pages “hummed and fluttered in time with the music,” as if the manuscript had come to life. ● Codex Amiatinus descends from a Latin Bible used by Cassiodorus (485-580). It was made at Jarrow, in Britain, before the Vikings’ onslaught of the town in 794. It weights a little over 75 pounds. Snake-tailed Cat is not amused. on the text of Matthew 26:2. 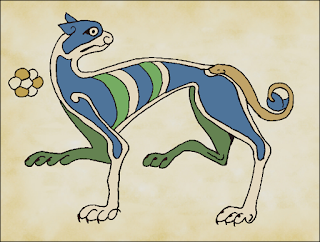 ● On a typical page of the Book of Kells – considered by many to be the most beautiful book in the world – “The decoration is more extensive and more overwhelming than one could possibly imagine.” This Gospels-manuscript is famous for its meticulous artwork and super-elaborate and unexpected details. (How many cats are in this manuscript? There’s Grumpy Cat (180v), Purple Cat (272r), Blue Cat (50v), Leaping Cat (40r), Tail-biting Cat (66r), Leg-biting Cat (68r), Cat with Eagle (69r), Cat with Fish (71r), Fat-tongued Cat (72v), Snake-tailed Cat (111r), and many more.) 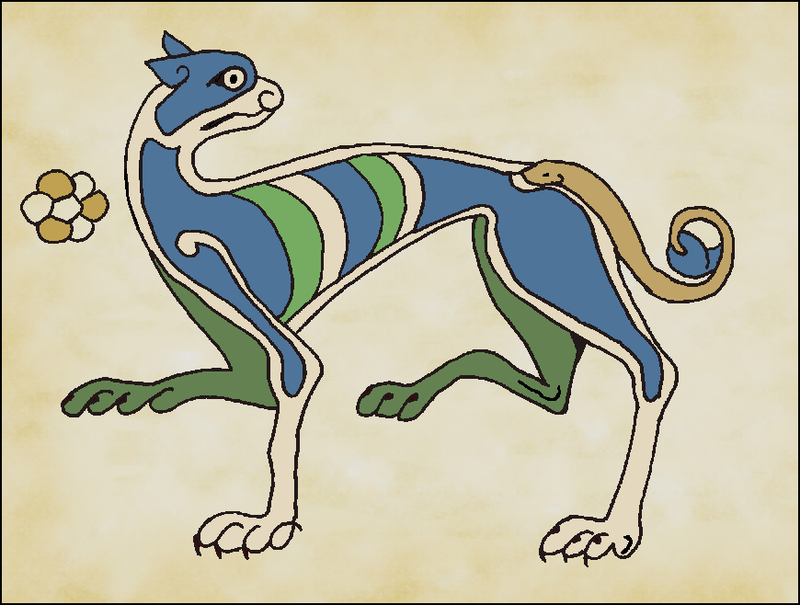 But the Book of Kells is also interesting textually; for example, it has the Alexandrian expansion of Matthew 27:49 (125v). in every street and marketplace of man. and ever do we need the help of Zeus. awakens us, and sends us to our work. This manuscript also features pictures of various constellations, and a geocentric diagram of the earth, sun, moon, planets, and zodiac constellations. The other manuscripts featured in this lavishly illustrated book are interesting due to their historical or literary importance, or because they are simply beautifully made. The most unusual one in the collection – the Carmina Burana, made in the 1200’s as a collection of love poems, humorous verses, pious songs, some quite unpious songs, and even a composition about chess – enjoys more popularity now than it ever did in the Middle Ages, since part of it forms the basis for a famous musical composition by Carl Orff. 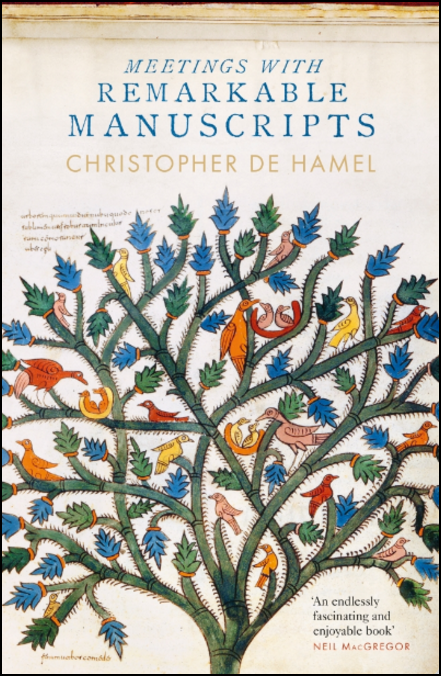 Dr. de Hamel has traveled many miles – to Paris, Munich, St. Petersburg, even California – to bring us these profiles in scribal skill and artistry. Those who join him in this journey of 610 pages will benefit from his experience, erudition, and engaging style. Meetings With Remarkable Manuscripts, by Christopher de Hamel, is © Christopher de Hamel, 2016. Published by Allen Lane, an imprint of Penguin Books. Other reviews (with pictures): History Today, Patricia Lovett, Irish Times , Sydney Morning Herald . >Codex Amiatinus descends from a Latin Bible used by Cassiodorus (485-580). We have yet another evidence that Jerome spoke accurately about how scribes would tend to drop the heavenly witnesses from the text. We see that in the discordance within Fuldensis and in how Amiatinus lost the verse known by Cassiodorus.